It was a political budget in a special sense, given the forthcoming election. Yet it turned out to be neither an election-winning nor election-losing budget. It was more continuity than change. In that sense it probably was the best the government could hope for given the nation's economic and financial circumstances. However it falls far short of the sort of budget that might have been expected from a prime minister like Malcolm Turnbull whose image is one off a 'big picture man'. No belief without a lie. No business without sin. No character without an act. No coffee without a fee. No courage without rage. No culture without a cult. No entrance without a trance. No epicenter without an epic. No Europe without a rope. No freedom without a reed. No friendship without an end. No fundamentalism without mental fun. 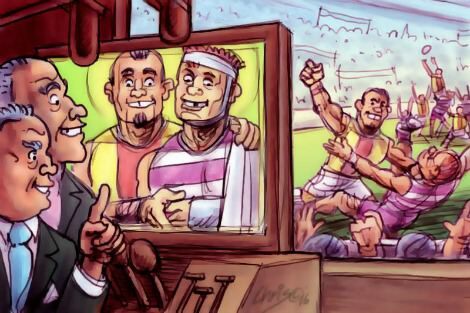 Arguably, as a society, Australia's tolerance for violence is waning, and both the AFL and the NRL have been proactive in diminishing the prevalence of deliberate and reckless violence that might endanger players' safety. Unfortunately, despite the AFL's desire to stamp out the more dangerous incidents, many televised football commentators are hindering the cause by making excuses for players, playing down the severity of their actions, and failing to condemn them. I have often wondered at the likely success of entreaties to compassion for asylum seekers. This is not because I do not personally feel compassion for these people. And it is not because I do not believe that it is morally correct to show compassion, including through government policy. Rather my response is partly a factor of my training as a lawyer. Through my legal eyes, I can see little hope for appeals to politicians to show compassion. My conditioned response instead is to appeal to law. It can be a dangerous thing, travelling to paradise. Those turquoise lagoons and white beaches and lush hills often conceal a more sinister side, a Mr Hyde to the brochures' bright-and-shiny Dr Jekyll. So it was on Samoa this week, when Cyclone Amos skirted by. We were told it was headed for Samoa's main island, Upolu, where we were staying. Still, we felt calm, for there wasn't a breath of wind in the sky. Later, at the height of it, I stood up in the dark, opened the curtains and looked outside. This week we learnt that the human rights protection for asylum seekers in our former colony Papua New Guinea are more protected by the PNG constitution than they would be in Australia. The PNG government has quickly moved not to change the law and constitution, but to make arrangements to close the centre and ask Australia to take back the asylum seekers. Already PNG lawyers are talking about claims for compensation for the unlawful detention, and rightly so. The federal government's new ad aims to 'stop violence from the start'. It sends a strong message that violence is never acceptable. But it firmly positions domestic violence as a problem of individual attitudes of perpetrators, not the social and economic vulnerability of victims. Envisaging an end of domestic violence achieved through 'starting conversations about respect with boys and girls' sidesteps the need for the material resources necessary to stop violence when it happens. The children are in the park today, running, skipping and laughing. They slide down the cannon, polishing the past with freshly-pressed pants, a mother's delight. 'Always tell the truth,' the mother says, 'If you lie, you'll burn.' ... The day is closing, patient and gentle in its suffering, but the great lies will not lie down. Lies breed lies like flies on dead sheep and the masquerade of maggots makes its creep. There have been attempts by some in the media to mount a moral justification of 60 Minutes' actions. At least they were trying to do the right thing, by helping a mother who would not have been denied custody in Australia But that opens another slimy can of worms. Do we think 60 Minutes would fund a child abduction in Australia, rather than a Muslim country with religious courts, however much the parent they were purporting to help might seem to have been denied custody unfairly?